Scientists have recorded images that allow them to see inside a hole in the moon for the first time. Though this is the fourth image recorded of the lunar pit - the angle of the sun and the Lunar Reconnaissance Orbiter (the camera responsible for recording the images) has allowed NASA scientists to see all the way to the base of the pit for the first time. The images have revealed that the walls of the pit are “layered”, finally proving the hole is what is known as a “cavernous subsurface cave” - a partly collapsed lava tube close to the surface of the moon. Scientists have been hypothesized the existence of caves on the moon for years – based on the behaviour of lava flow and mare deposits on Earth, but until now have been unable to prove these exist on the moon. It has been found that the lava tubes may make a great location for human lunar bases. The pit is wide and deep enough to protect people from dangerous meteorite impacts, cosmic rays and extreme temperature fluctuations. In May of last year, NASA’s Lunar Reconnaissance Orbiter (LRO) returned images of the dark cavernous hole but it was too dark that scientists could only hypothesize it was a “skylight” buried in a lava tube under the surface of the moon. 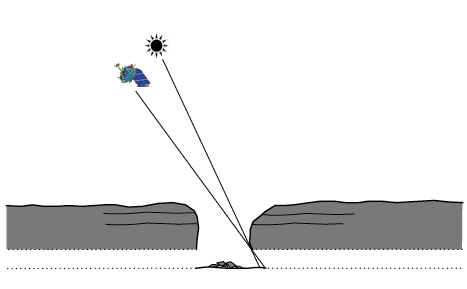 On this orbit, scientists positioned the camera just so that if there was indeed an open lava tube that extended horizontally under the moon’s surface, its floor would be highlighted.